Sergio Marchionne is undoubtedly stocking up on black turtlenecks as we write this. The revived Cinquecento, according to the Fiat boss, is the cornerstone of his attempt to turn the company into "the Apple of cars, and the Cinquecento will be our iPod." The diminutive hatchback has already seen orders in excess of half of the fifty thousand units of goodwill the automaker plans to crank out this year, and they're considering raising full-model-year targets from 120,000 cars to 140,000, at a base price of ten thousand euros. 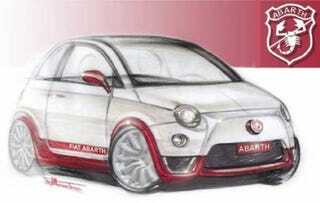 Meanwhile, does anyone know where we can get Abarth tape stripes for a 30 gig iPod? Thanks.